Lucy Phoebe married in early 1794 and had eight children, three of whom died during infancy. We understand one daughter married a missionary and went to India; one son became a missionary in South Africa; and another son went to New York as a Congregational parson. Lucy’s granddaughter came from England in the 1840s bringing this gown with her as a family heirloom, and it has been passed down through the maternal line of the family. Lucy Phoebe’s gown consists of lincoln green damask brocade, with a tight fitting bodice and fully gathered skirt. 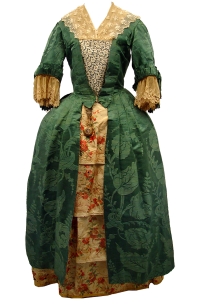 It is an open robe redingote style of 1787 and was originally worn over a blue petticoat. The shape of the skirt was achieved with the aid of a cane pannier frame underneath. The underdress is handloomed silk from Spitalfields. Loops within the skirt permitted the train to be shortened and raised. The back is characterised by the loose pleats flowing from the shoulders and fastened at the back of the waist. The outfit is completed with a lace fichu at the neck. Lucy Phoebe’s gown has required considerable restoration.